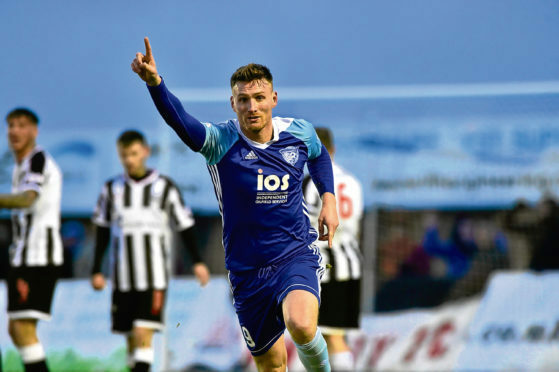 Peterhead booked their place in the League 1 Play-off final with a resounding victory against Stirling Albion at Balmoor Stadium. Leading 1-0 from their midweek win, Jim McInally’s side secured a 4-0 aggregate victory thanks to goals from Mason Robertson, Rory McAllister and Jason Brown. Peterhead manager Jim McInally made one enforced change to the side which won 1-0 at Stirling the first leg in midweek with captain David McCracken missing out due to injury. His place in the starting line-up was taken by Aidan McIlduff. Peterhead had to endure playing against a strong wind in the first half and Stirling but the Blue Toon defence under early pressure with Darren Smith seeing a header saved by Greg Fleming. But the home side got to grips with the challenging conditions and Rory McAllister and Scott Brown saw a couple of shots saved by Binos goalkeeper Cameron Binnie before Peterhead’s pressure paid off with the opening goal before half-time. Mason Robertson got the all-important breakthrough when he headed Willie Gibson’s header past Binnie off the underside of the crossbar. Peterhead put the tie beyond their opponents with two goals in eight minutes in the second half. Scott Brown crossed for McAllister to fire home the second of the game and Jason Brown made it 3-0 when he sidefooted Scott Brown’s cross past Binnie.